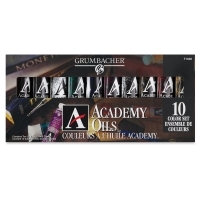 Grumbacher's Academy Oil Colors are a favorite of college and advanced secondary students. They offer a generous load of pigment and excellent tinting strength. These sets are an excellent gift for a beginning oil painter. 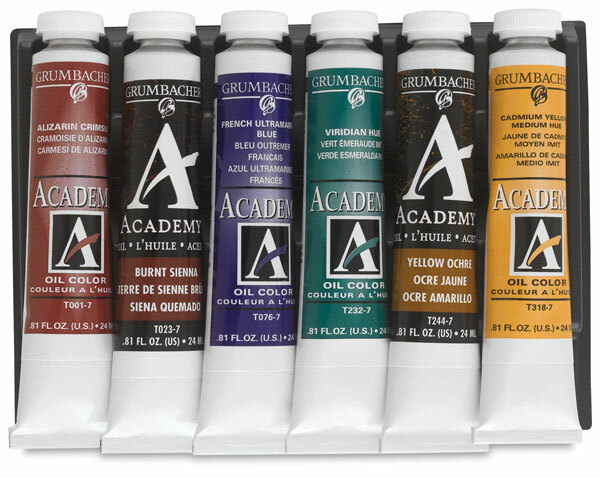 10-Color Set — Contains 10 colors in .81 oz (24 ml) tubes, including Burnt Sienna, Burnt Umber, Cadmium Red Light Hue, Cadmium Yellow Medium Hue, Ivory Black, Thalo Blue, Thalo Green (Blue Shade), Thio Violet, Titanium White, and Yellow Ochre. 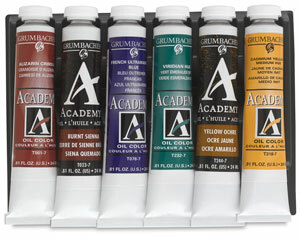 12-Color Collegiate Set — Contains 12 colors in .81 oz (24 ml) tubes, including Burnt Sienna, Alizarin Crimson, French Ultramarine Blue, Viridian Hue, Yellow Ochre, Cadmium Yellow Medium Hue, Titanium White, Ivory Black, Cadmium Red Medium Hue, Cobalt Blue Hue, Burnt Umber, and Cadmium Yellow Pale Hue. The set also includes an instruction booklet and mixing guide. 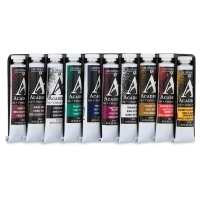 6-Color Collegiate Set — Contains 6 colors in .81 oz (24 ml) tubes, including Burnt Sienna, Alizarin Crimson, French Ultramarine Blue, Viridian Hue, Yellow Ochre, and Cadmium Yellow Medium Hue. The set also includes an instruction booklet and mixing guide.